Earlier this week Microgaming announced that it has added two more multiplayer slots games to its catalogue, Karate Pig and Leagues of Fortune. 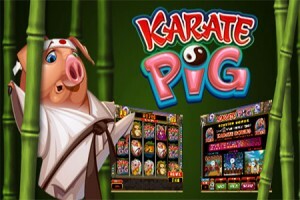 Microgaming is releasing two new multiplayer slots, Karate Pig and Leagues of Fortune. Karate Pig is a 5 reel, 40 payline slot featuring cute animal symbols and a huge range of bonus features such as stacked wilds, scatters, free spins, multipliers and a great bonus game. It is a truly interactive slot where playres much try and qualify for all seven karate belts before the Final Showdown bonus round. Leagues of Fortune is also a 5 reel slot and has an astonishing 1024 different winning combinations. The game features fantastic graphics and animations and a number of special features such as the Gamble function with up to 20x bet size per spin and a giant squid that can award between 6 and 35 spins. Microgaming is including these new slots in its multiplayer slots tournament schedule. Karate Pig is part of a mid-week, 3-day Survivor knockout tournament which has a $2,000 prize pool which will be split between the top ten players. Multiplayer slots tournaments are a great way to play your favourite games and increase your winnings by competing against other online players.